Prepare a zesty, grilled tuna dish that is both elegant and tasty! 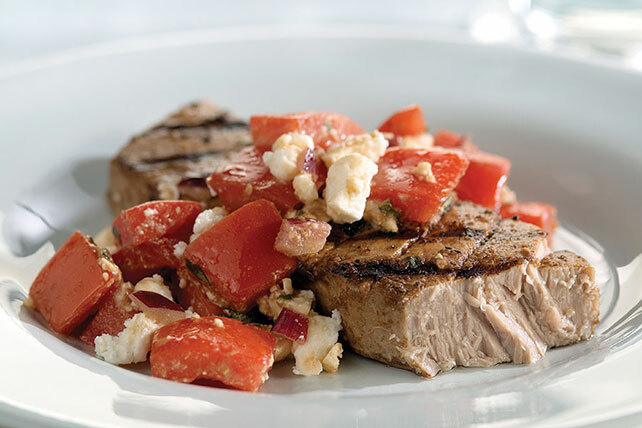 Veggies and feta cheese add flavor to our Zesty Grilled Tuna with Fresh Tomato Salsa. Mix first 4 ingredients until well blended. Stir in 1 Tbsp. basil. Mix 2 Tbsp. dressing mixture with remaining basil, tomatoes, onions and cheese; set aside. Pour remaining dressing mixture over tuna in shallow dish; turn to coat both sides. Cover; refrigerate 30 min. to 1 hour to marinate. Heat greased grill to medium-high heat. Remove tuna from marinade; discard marinade. Grill tuna 5 to 7 min. on each side or until tuna flakes easily with fork. Serve topped with tomato mixture. Substitute mahi mahi steaks for the tuna steaks. To cook tuna under the broiler instead of on the grill, place marimated tuna on rack of broiler pan. Broil, 4 to 6 inches from heat, 5 to 7 min. on each side or until tuna flakes easily with fork.